Baghdad - The price of conducting the profession of journalism in Iraq is often abduction, killing, detention, or death by car bombs or explosive devices -- one of which struck down our colleague who worked as a correspondent for the Voices of Iraq agency in the course of his professional duty as he covered of one of the security events in Diyala province. 'Arif Falih, 33, was an ambitious young man who persevered in order to carve out a remarkable place for himself in the field of Iraqi journalism, forsaking the dangers and the conditions that surrounded him, and which took his life, said one of 'Arif’s friends when he informed his agency of the news of his death. Dhia Rasn, an Iraqi journalist and colleague of 'Arif, who worked with him in the Diyala Institute for Human Rights Law as a researcher, said that 'Arif was “very courageous, and that he worked in an area completely devoid of law and authority.” 'Arif was afraid of militants, said Dhia, “but never feared for a single day to travel in search of the truth and the news,” adding that “he might have been the only one working to transmit the truth from Diyala province.” Dhia said that 'Arif helped make Voices of Iraq’s coverage of the news from Diyala province stand out as unparalleled. The Voices of Iraq (VOI) agency, for which 'Arif was working, has lost other correspondents, in Amara and Mosul. In the city of Amara, in southern Iraq, one of their most prominent correspondents, Nizar al-Radi, was killed when unknown gunmen opened fire on him on May 30 of this year. Some of the people who were near the site of the attack said that a group of gunmen riding in a pick-up truck opened fire on al-Radi while he was accompanied by other journalists, as they were heading for the opening of a media workshop in a hotel in the Amara city center. On June 7 of this year, the group “Ansar al-Sunna” killed another of VOI’s correspondents, Sahar al-Haydari, 45, showering her with machine-gun fire when they observed her in the al-Hudaba district in northern Mosul. Al-Haydari’s name appeared on an assassination list announced by the so-called “Emir of the Islamic State in Mosul,” and she had received 13 death threats before she was targeted for murder. Murders, abductions, and threats represent a dangerous violation of freedom of expression, exceeded only by the impunity of their perpetrators. As long as the attackers know that they will never bear responsibility for their crimes, journalists will remain an easy target and attacks will continue against them. 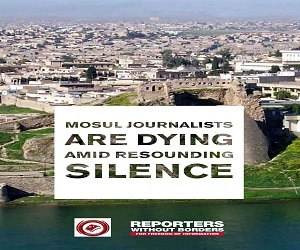 The Journalistic Freedoms Observatory affirms that all operations of killing and abduction against journalists in Iraq are attributed to terrorist groups, or to unknown gunmen who cannot be found or identified, while the American and Iraqi forces ignore the gravity of their responsibility -- even if a journalist was killed by the gunfire of these forces, either accidentally or by direct targeting, as the military authorities have failed to provide a complete and public account of several members of their forces who have committed acts of killing, arrest, or harassment of journalists. Journalists and media workers are targeted at an accelerated rage, and the breadth of the dangers that they face widens day after day. Falih Wadai Majdhab, 53, who worked as the director of editing in the publicly funded newspaper al-Sabah, was abducted on the morning of June 13 after unknown gunmen blocked his way in the al-Habibia district of southeast Baghdad, and took him to an unknown place. Four days later his body was identified in a Baghdad morgue. The fate of 12 of Madhjab’s colleagues abducted before him is still unknown. The journalist Samir Muhammad, who worked with a French newspaper, said that he was headed to the Medical College to look at figures from the ministry of health, especially civilian casualties. When he asked one of the members of the police to let him enter the ministry, the policeman said that he should go to a different building nearby to look at the figures and statistics, offering to accompany him. Samir adds, “After I walked with the policeman to a phantom administration building, the policeman forced me into a car that approached behind us,” putting the service revolver “used by the interior ministry” to Samir’s head. Miraculously, the Samir emerged from this situation after his kidnappers’ car arrived near a checkpoint run by the Multinational Coalition. One of his kidnappers struck him, and opened the door for him to get out of the car. According to the figures of the JFO, Iraq has become the most dangerous of all places in the world for journalists, after the invasion by US forces and the Coalition. 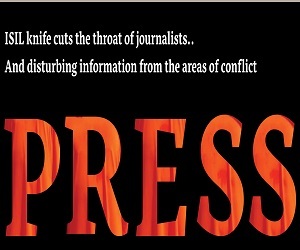 Since the invasion, Iraq has witnessed gross violations against journalists and media workers. The acts of violence and the deterioration of the security situation have led to the killing of 196 media workers, among them 106 journalists who were killed because of their work, and 39 technicians. Mystery surrounds 61 terrorist operations that targeted journalists and technicians in an indirect way, that is, they were not targeted directly because of journalistic work. Moreover, more than one media institution has been targeted with car bombs or armed operations that leveled them to the ground, killing members of their crew and ending their transmissions, such as the broadcaster Radio Dijla, the Baghdad satellite channel, the al-Sha'biya satellite channel, and the office of al-'Arabiya channel. In Iraq, many have not been accustomed to freedom of opinion and a free media, as the changes that obtained after 2003 are not familiar. Because of this, several attacks have been conducted against journalists and their institutions, and some media institutions have been closed by the security apparatuses of successive Iraqi governments after the fall of the old regime, such as al-Jazeera International channel, the al-Sharqiya channel, and Salah al-Din satellite channel. A correspondent for al-Sharqiya channel, known as Abu Ahmed, expressed his alarm at the intensity of the increasing wave of targeting of journalists in Iraq, saying that “the threats have become a part of journalistic work in Iraq”. Abu Ahmad added that the media organization for which he worked had lost four of his colleagues -- two journalists, a television cameraman, and a director -- in a period not exceeding one month. As for the fear of the politicians and the security forces, Abu Ahmad continued, “the security apparatus and the government respect the laws of the press only in the case of calm, and usually encroach on media workers when they are trying to cover turbulent events”. “insults, verbal abuse, beating, and confiscation of some of the journalistic equipment”. As for the law published by the Iraqi legislative bodies that permits journalists to carry weapons, Ihsan Mahmoud, another journalist working for a local institution, considers that it “may be a political football” allowing the authorities “to be rid of (the duty of) protecting journalists by governmental agencies”. The journalist Ilham Muhammad, correspondent for the al-Sumeria satellite channel, that the risks that confront journalists in Iraq are not of the kind that their peers face in the rest of the world, because the conflict in the country has many different parties, and all of the parties persecute journalists if they write a report that does not satisfy their particular group. An official in the Iraqi Ministry of Defense, speaking anonymously, said that "the difficult conditions and the foul mood of the soldiers and policemen" is “the principal reason for the arrest and beatings of journalists,” adding that there is no intended campaign against journalists. 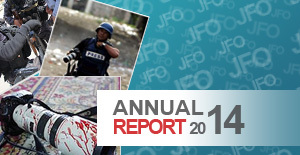 The Journalistic Freedoms Observatory has observed, over the course of one year, 123 cases of different violations against journalists and their media institutions, and among these violations are cases of direct government interference in limiting the freedom of the press, including even parliamentary interference. Even the judiciary has not been impartial, as 17 journalists and media institutions have been tried without reference to the relevant laws. Local and international reports that on journalists’ affairs confirm that the number of journalists killed in Iraq exceeds, by as much as double, the number of journalists killed throughout the Vietnam War.